The power outlet can be used for electrical appliances. To use the power outlet, turn on the main switch. The power supply starts a few seconds after the main switch is pressed. The maximum capacity of the power outlet is always 120 VAC/100 W.
The maximum capacity of the power outlet varies depending on the following conditions. • The shift lever is in N and the clutch pedal is not depressed. (manual transmission) A maximum capacity of 400W can only be restored by turning the power outlet main switch off and then on again under condition described above. ● The maximum capacity is 120 VAC/100 W when the following condition applies: • The shift lever is moved to any positions other than P and N.
The sound of the cooling fan may be heard from the front console box. This is normal and does not indicate a malfunction. The maximum capacity of the power supply may decrease to below the standard, or may be cut off completely, even when the vehicle is stationary. ●The engine is started with the power outlet main switch on. ●Use of electrical appliances exceeding the maximum capacity is attempted. A sound may be heard when the protection circuit is activated. ●Electrical appliances, which consume power exceeding 100 W, have been used continuously for a long time period. ●The total power usage by all electrical features (headlights, air conditioning, etc.) has exceeded the total vehicle maximum for an extended period of time. 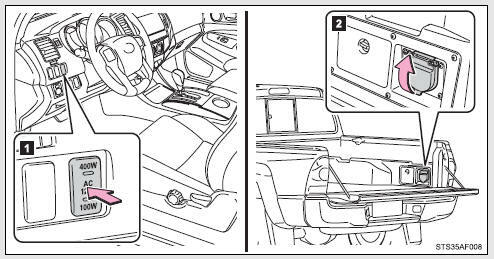 Park the vehicle in a safe place, and then securely apply the parking brake. Check and ensure the following conditions: •The shift lever is in P or N. (automatic transmission) •The shift lever is in N and the clutch pedal is not depressed. Make sure that the power consumption of the electric appliance is within the maximum capacity of the power outlet and the appliance is not broken. Press the power outlet main switch again. When the cabin temperature is high, open the windows to cool the temperature down. Once it reaches the normal temperature, turn the power outlet main switch on again. If the power supply is not resumed even after performing the above procedure, have the vehicle inspected by a Toyota dealer. Observe the following precautions to reduce the risk of injury. ●Use of the power outlet when it is wet with rain, drinks water or snow may result in electrical shocks and is extremely dangerous. The power outlet must be thoroughly dried before use. ●Do not allow children to use or play with the power outlet. ●Be careful not to get any part of your body caught in the power outlet lid. ●When using electrical appliances, strictly follow any cautions and notices written on their labels and in the manufacturers’ instruction manuals. ●Do not modify, disassemble or repair the power outlet or its inverter, in any way. Doing so may result in unexpected malfunctions or accidents, which could cause serious damage or injuries. Contact a Toyota dealer for any necessary repairs. ●Distract the driver while driving, or hamper safe driving. ●Result in a fire or burn injuries due to the appliance rolling, falling or overheating while driving. ●Emit steam, while the windows of the cabin are closed. ●Using the power outlet for electric heaters while sleeping. ●Contaminating the power outlet with liquid substances or mud. ●Handling electrical appliance plugs at the power outlet with wet hands or feet. ●Inserting foreign objects into the power outlet. ●Inserting inappropriate or badly fitting plugs into the power outlet. ●Close the power outlet lid when not in use. ●Foreign objects or liquids that enter the power outlet may cause a short circuit. ●Do not use plug adaptors to connect too many plugs to the power outlet. ●After inserting a plug, gently close the power outlet lid. Do not use a 120 VAC appliance that requires more than maximum capacity. If a 120 VAC appliance that consumes more than maximum capacity is used, the protection circuit will cut the power supply. The following 120 VAC appliances may not operate even if their power consumption is under maximum capacity. Turn off all the vehicle’s electronic equipment and accessories, such as the headlights and air conditioning, when electrical appliances that consume in excess of 100W are used continuously for long periods of time. ●Do not use any electrical appliances that give off intense heat such as toasters, in any locations including the internal or external trim, seats and deck. ●Do not use any electrical appliances, which are easily affected by vibration or heat, inside the vehicle. Vibration while driving, or the heat of the sun while parking, may result in damage to those electrical appliances. Securely fasten both the appliances and their cables to prevent them from falling or getting caught any of the power train components. Contact a Toyota dealer for any necessary replacements. Turn the main switch off and use a soft, clean cloth to wipe it gently. Do not use any cleansing materials, such as organic solvents, wax, or compound cleaners, as these may damage the power outlet or cause it to malfunction.